Twelve years ago today I was sitting at my desk at Harvard Law School where I worked as a faculty assistant for Elizabeth Warren when my mom called to tell me that a plane had hit one of the World Trade Center Towers. At that time, it was still unclear as to what had happened, so I hung up with the assumption that a pilot in a small aircraft had gone terribly but unintentionally astray. A tragedy, to be sure – but nothing like the magnitude of horror that it proved to be. I didn’t have Internet access at that time, so I continued to work, unaware of what was happening in New York, DC, and Pennsylvania. My mom called again later and said simply, “It’s gone,” and then she hung up, unable to say anything more. What she meant was that the first tower had disintegrated. By that time, a television had been set up in another room at the Law School and tens of us stood watching the footage coming in from lower Manhattan. I would bet that everyone else felt the same way that I did: as if I’d been kicked hard in the stomach, accompanied by a fear of the future I’d never experienced before in my life. I finished the work day in a daze and after that it seemed as if life was consumed by the stories unfolding from that horrible day. The world – everyone’s world – changed completely. September 11, 2001 remains like a shadow over many of our lives, but the shadow is especially dark on the anniversary of the event, so I wanted to take a moment in honor of the people who perished that day. Sitting at number 9 on 29 Ways to Honor the Glory of Peanut Butter & Jelly, my version of peanut butter and jelly muffins brings us to Day 8. The original muffin, from Sweet Potato Chronicles, has sweet jelly nestled in the middle of a peanut-butter flavored muffin. For my recipe, I turned to an old, old favorite of mine that I’ve featured in another recipe: Double Chocolate Snack Cake. I replaced all of the oil with peanut butter, but kept the cocoa powder and the “double” – chocolate chips. Fresh, sweet raspberries stand in for the jelly and add a nice surprise. Fresh raspberries brighten up these deep, dark chocolate and peanut butter muffins. Preheat oven to 350-degrees and lightly spray 12 muffin tins with oil. In a large bowl, whisk together the flour, sugar, cocoa, baking soda, and salt. In a smaller bowl, whisk together the nut milk, peanut butter, vinegar and extract. Pour this into the dry ingredients and stir well. Stir in the chocolate chips and then gently fold in the raspberries. Divide the batter between the muffin tins and bake for 30-35 minutes or until a toothpick comes out clean. Let muffins cool for a while in the pan, then gently remove and let cool completely on a wire rack. Those look amazing! I can’t have peanut butter until I’ve weaned my peanut-intolerant daughter, but I may try these with almond butter in the meantime. I love your theme! PB&J is the best and I miss it so much. Almond butter will work perfectly! I love the look of those raspberries. What happened on September 11 2001 changed the world and it’s still shocking to think of it all these years on. It is, Lorna. I still get that awful feeling when I think about it. I remember I was in grad school at the time and all our classes got canceled. I went home and my roommate and I were on the phone with family and friends almost all day. I am really enjoying your PB&J theme! I mentally adapt it all toward sunbutter for my little guy! I can’t wait to see every recipe! Thanks, Holly! Sunbutter sounds great – I need to try it! I am so so so behind on commenting on your MoFo posts! BUT oh goodness I am loving them don’t worry! I know you’re out there, girl :-). Every morning before I went in to work, I’d at least look at the headlines on CNN’s website, and I’d joke about it, saying that I needed to see what was going on, in case the world had blown up while I was asleep – and that morning was the first day I missed that little ritual. I got in (I was an administrator for a small private school at the time), and all the teachers were huddled together in front of the news, and I had no idea what was going on…. But your muffins look fantastic… I love raspberries ! Awful. Sometimes it feels as if it just happened. Hard to believe it’s been 12 years. Mmm, raspberries and nut butter…yum! I vividly remember where I was on 9/11/01. I spent all day freaking out because I couldn’t reach my older brother who lives in NJ and was supposed to be attending a meeting at the Twin Towers that morning. It was impossible to get through on cell phones all day. Finally around 7pm that night my brother called me! He told me the freakiest thing that still gives me shivers just thinking about it. He had dreamed about big explosions and fire that night so when his alarm went off that morning, he decided to call off from work. That dream saved my brother’s life! Holy cow!!!! That is an amazing story! So incredible that he listened to that dream and to his instincts. What a frightening day that must have been for you both – cannot imagine. Thanks for sharing! First of all, beautiful first paragraph. Secondly..these muffins looks delicious. What on earth are you doing with all these goodies you are preparing DAILY!? There is not way your small family can go through entire batches of baked goods in one day..or is there!? We probably could consume massive quantities…But I cheated. I worked on my MoFo posts over the past 5 months :-)! Your theme… *sniffle*… is one of the best themes in the history of themes! You rock! 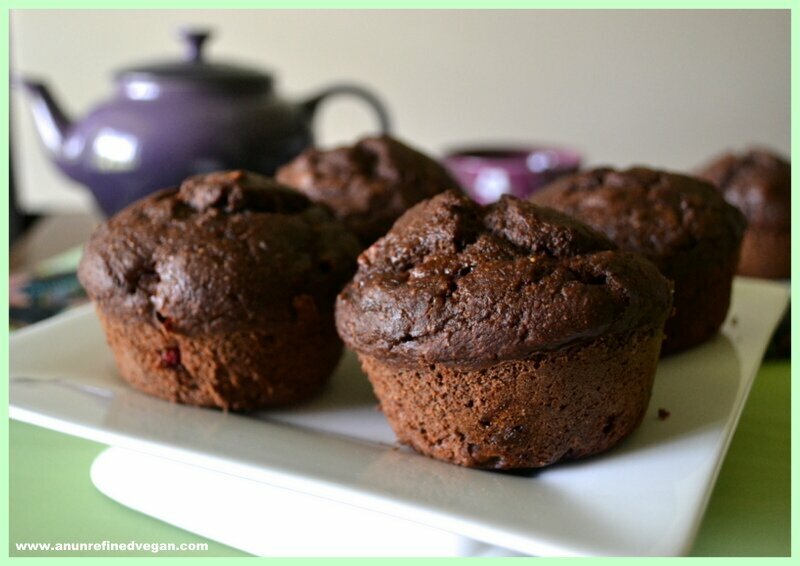 Drooling over these…muffins..chocolate and berries….yes, please. I’ll take 5! I love muffins! They’re my favourite “naughty” breakfast 🙂 Chocolate PB + J sounds amazing!! Georgous, georgous, georgous, Anne! I will make these tonight!!!! Yummmmm. Beautiful, beautiful post. The muffins look and sound so good too! Pingback: Peanut Butter & Jelly Day!